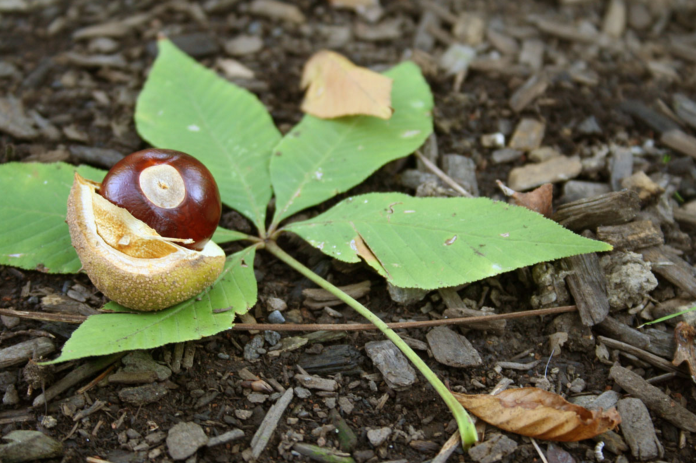 Ohio buckeye has proven to have good drought tolerance and is indifferent to soil conditions, making it suitable for planting across Nebraska. The tree is an attractive ornamental, best in open, natural settings or parks because of its broad crown. It is also shade tolerant. Ohio buckeye has palmately compound (fan-shaped) leaves (typically 5 leaflets) that can turn a nice orange-red in the fall, though they are often discarded early in dry years. Flowers are borne in late spring on noticeable green-yellow panicles about 5-7” long. Ohio buckeye is one of the first trees to leaf out in spring. Flowering: March-May, after the leaves appear; fruiting: September-October. Despite the poisonous properties to humans and livestock (more below), squirrels are known to eat the raw seeds. All parts of the plant (leaves, bark, fruit) are highly toxic if ingested. Symptoms are muscle weakness and paralysis, dilated pupils, vomiting, diarrhea, depression, paralysis, and stupor. Many landowners have eradicated it to prevent livestock poisoning. Additional species one could try planting are the red or yellow buckeyes. Native Americans ground buckeye to use as a powder on ponds to stun fish.